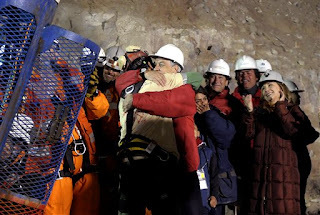 This week the news is being dominated by the story of the nation of Chile banding together to rescue trapped miners from a collapsed mine, miles below the surface of the earth. When I learned that the first of the men had been returned to safety, I was overjoyed. It’s inspiring! People working together! People helping people out of deep dark holes! LITERALLY! Unfortunately, recent news has also been filled with tales of young people stuck in deep metaphorical holes. Several LGBT teens, and teens bullied by people who perceived them as gay, have committed suicide in the past several weeks. Gay teens in U.S. schools seem, at the moment, to be in a sort of collapsed mineshaft socially: GLSEN reports that 9 out of 10 gay teens experience harassment at school. You might ask, where’s the high tech apparatus that will haul the gay kids out of that hole? High school is difficult enough for so many young folks that no one deserves the added stress of ostracism and bullying. To the rescue: Dan Savage’s It Gets Better project on YouTube. Savage, a writer in Seattle, made a video with his partner to tell LGBT youth that, no matter how bad thing seem, life gets better when you grow up. Hundreds of people have posted videos in response, mostly featuring gay adults who offer their own happy lives as proof that it’s possible to survive the difficulties of growing up gay. Thankfully, this isn’t the only moment of inspiration that I’ve noticed lately. Let’s hope we can all keep finding ways to pull each other out of deep, dark places.